From cots that look like playhouses to matching wallpaper and pjs, we see a lot of incredible, gorgeous nursery decor. 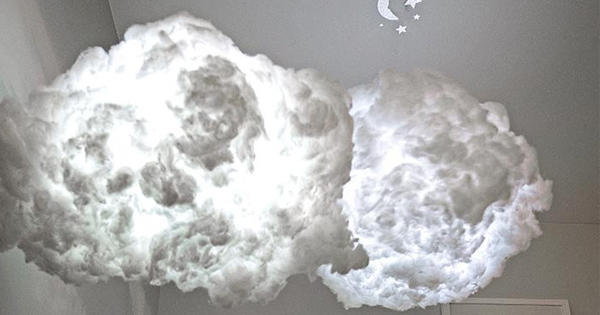 Add to the list Lil Spaces’ amazing Cloud Lights that are one part dreamy, one part drama. Lil Spaces is a Canberra-based designer of nursery decor. It’s a finalist in the 2015 Etsy Design Awards, and it’s easy to see why. We’ve featured its contemporary prints before, but the Cloud Light is definitely the stand out piece. Sculpted by hand from natural fibres and equipped with a low voltage, battery powered LED bulb, each cloud light is a little bit different. They hang from a colourless nylon thread so they appear to float through the room, and when turned on, they project a moon and stars onto the ceiling. Because each light is handmade to order, Lil Spaces Cloud Lights ship in 2-3 weeks. Small cloud lights are $99 while large cloud lights cost $129. Shipping in Australia is $21.